I've read a lot of arguements on this but I usually do the AI method mentioned above. I do it as part of sighting in so it's no big deal anyway. Slightly off-topic, I've only ever had one custom barrel and when I got it I was warned that it would take approx. 100 rounds for it to settle down. First groups were .75" at 100m at best but sure enough it did tighten up the more I shot it. Anyone else experience this? Just checking if anyone has a Harris bipod adaptor for an AI AT that they'd like to part with? What about stock options? I've read the folder makes cleaning easier and can obviously fit in to a smaller bag / case What do most people use? Not trying to sound flaky, probably phrased it wrong but I really like the look of AI rifles and I think the AI brake / suppressor is a good design. Appreciate the replies. One of the AI's on Sunday was a .338 ( rare as hens' teeth around here) and it was seriously loud with the brake, but very impressive! The other was a 300 Win Mag so no slouch decibel-wise either. I've nothing against brakes but I'd rather not be on the firing point beside one given the option. Thanks TJC. Nearly all my shooting is on range. I currently use a Jet Z on an AE Mk1. I don't use it without the mod and I couldn't see myself leaving off the mod to use just a brake. 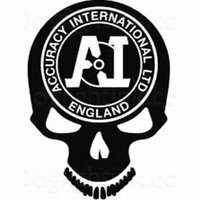 That said, I saw two AI's on the range yesterday - both had the AI brake / suppressor. It just finishes off the rifles having the factory supplied brake / mod. baldie - thank you for the reply. Good point on getting the M18 x 1.5 thread If I can throw another question out there - I think I'll go for the 20" barrel option. Most of my shooting is <300m with the occasional competition at 600m. I'm assuming the shorter barrel will have no issue with these ranges? Hi, First post from a lurker. If this is still for sale I'll take it please.